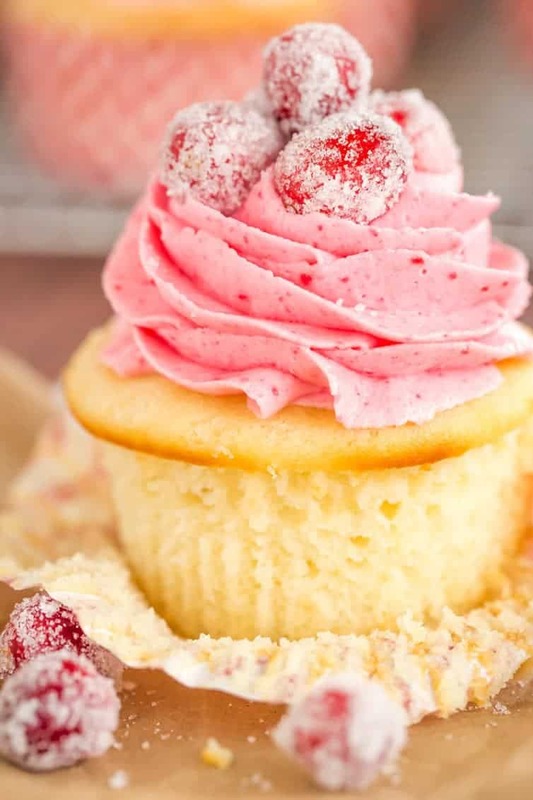 Simple vanilla cupcakes are filled with a white chocolate ganache, topped with cranberry buttercream frosting, and are garnished with sugared cranberries. These cupcakes! Talk about gorgeous and festive! Remember those sugared cranberries we made yesterday? Here they are! I originally wanted to make these for Thanksgiving, but you know, life with a toddler and a newborn had other plans for me. However, I found some time over the weekend to finally make them happen, and they were every bit as wonderful as I imagined they would be. I think they would be just as wonderful for a Christmas or holiday party dessert, as they would have been for Thanksgiving. This recipe comes from the cookbook Simply Beautiful Homemade Cakes by Lindsay Conchar, the sweet blogger behind the website Life, Love and Sugar. I have been lusting over Lindsay’s gorgeous cakes for years – each one is a serious showstopper and leaves me ogling my computer screen and drooling. So needless to say, I was elated to get my hands on a copy of her cookbook, and it is just as fabulous. 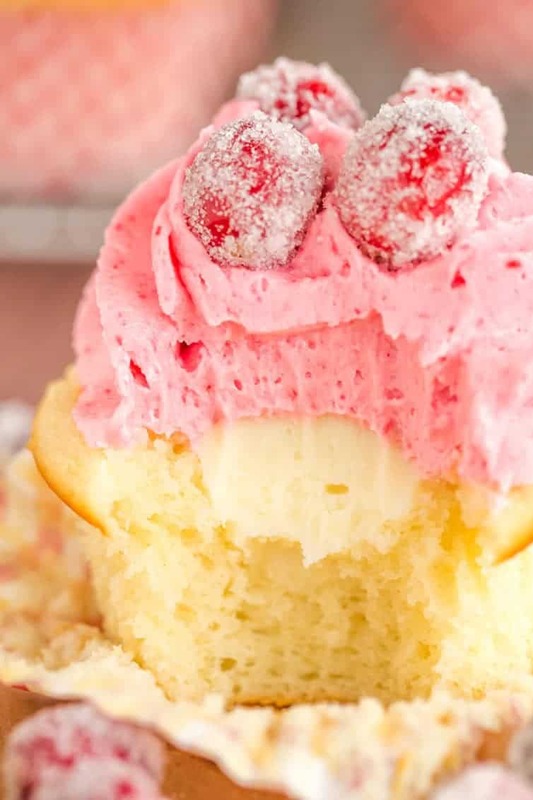 Along with incredible recipes, Lindsay also includes an entire section with tons of step-by-step photos of basic techniques, such as frosting cakes and how to make the perfect cupcake swirls. I want to make every single recipe in the book, and had such a hard time deciding which one to start with. The festive nature of these cupcakes won me over given the time of year, and they were a huge hit with my Sunday dinner crowd. While there are a few different components, they are all fairly simple and straightforward. If you’re looking for a wonderfully festive dessert for this holiday season, keep the cranberry love going with these cupcakes! The cake itself is a simple white vanilla batter that mixes together quite easily. The centers are cored out, then filled with a white chocolate ganache. A frosting is made from a fresh cranberry puree (such a pretty shade of pink! ), and the finished product is topped with gorgeous, sparkling sugared cranberries. Totally worthy of your holiday dessert table! Vanilla cupcakes with white chocolate ganache filling and cranberry buttercream frosting, topped with sugared cranberries. Make the Cupcakes: Preheat the oven to 350°F (176°C) and prepare a standard muffin pan with cupcake liners. In a medium bowl, whisk together the flour and baking powder; set aside. In a measuring cup, combine the milk and water; set aside. Using an electric mixer on medium speed, cream the butter and sugar together until light in color and fluffy, about 3 to 4 minutes. Add the vanilla extract and sour cream and mix until well combined. Add 1 of the egg whites and mix until well combined. Add the remaining 2 egg whites and mix until well combined. Scrape down the sides of the bowl as needed to be sure all ingredients are well incorporated. Reduce the mixer speed to low; add half of the flour mixture and mix until just incorporated. Add all of the milk mixture and mix until combined. Add the remaining half of the flour mixture and mix until well combined and smooth, scraping down the sides and bottom of the bowl as needed. Fill the cupcake liners about halfway full. Bake the cupcakes for 15 to 17 minutes, or until a toothpick inserted comes out with a few moist crumbs attached. Remove the cupcakes from the oven and allow them to cool for 5 minutes, then remove them from the pan and transfer them to a cooling rack to finish cooling completely. Make the White Chocolate Ganache: Put the white chocolate chips in a small microwave-safe bowl. Heat the heavy cream in a small saucepan over medium heat until it just starts to boil, then pour it over the white chocolate chips. Cover the bowl with clear plastic wrap for 3 to 4 minutes, then whisk until smooth. If the white chocolate is not completely melted, microwave the mixture in 10-second intervals, stirring well between each interval, until smooth. Set the white chocolate ganache aside to cool a bit and thicken while you prepare the frosting. Make the Frosting: Combine the cranberries, water, and the sugar in a small saucepan and cook over medium-high heat for approximately 5 to 7 minutes, until the cranberries begin to pop. Remove the cranberries from the heat and set them aside to cool for about 5 minutes. Transfer the cranberries to a food processor and puree until smooth. Strain the puree though a fine-mesh sieve. You should end up with about ¼ cup (60 ml) of cranberry puree. Using an electric mixer on medium speed, beat the butter and shortening until combined and smooth, about 2 minutes. Slowly add 1½ cups (173 grams) of the powdered sugar, mixing until smooth after each addition. Add the cranberry puree and mix until well combined. Add the remaining 1½ cups (173 grams) powdered sugar and mix until well combined and smooth. Beat on medium-high speed for 1 minute. Assemble the Cupcakes: Using a paring knife, cut a hole out of the center of the cupcakes, going about halfway down. Fill with the white chocolate ganache. 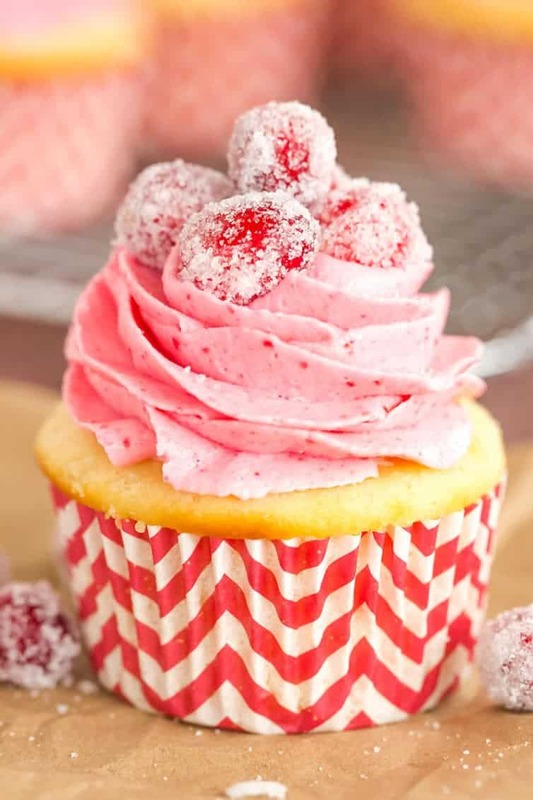 Frost the cupcakes with the cranberry frosting using an Ateco #844 or Wilton 1M decorating tip. Leave the top center of the swirl open, rather than fully completing the swirl. Place the sugared cranberries on top of the frosting, filling in the top of the swirl of frosting. The cupcakes should be stored in an airtight container at room temperature for up to 3 days. Hi, I was just wondering if we could use all butter in place of the shortening in the frosting? I tested this recipe today for a family Christmas get together next month. They looked and tasted amazing. The only issue I had was the White Chocolate ganache. It firmed up in the cupcake. Is this normal? Any idea why this would happen? Thanks for sharing this recipe. Hi Ada, It should stay fairly soft; you could increase the heavy cream a bit if it hardened too much. Glad you enjoyed them! Best cupcakes ever! Made them to take to work and everyone raved about them. I had several people tell me they were the best cupcakes they ever had. This looks like an amazing recipe, and I can’t wait to try it! I was just wondering, would it be possible to make this recipe with strawberries instead of cranberries? Cranberries are not available where I live, there are absolutely none to be found! I would like to make these scrumptious-looking cupcakes with strawberries instead. Do you think that would work? Do you have access to frozen cranberries? That would be a good option. I don’t know that I would strawberries here because they will release SO much more liquid than cranberries do. Unfortunately no; I can’t even find frozen cranberries. The only berries available (fresh/frozen) are strawberries, raspberries, and blueberries. I was thinking of perhaps making a strawberry frosting, since I don’t have cranberries at hand. Perhaps if I change the frosting recipe a little to deal with the liquid from the strawberries? Ahhh bummer! Yes, I think you’d need to account for extra moisture from the strawberries but otherwise should work. Enjoy! I made these for Christmas last year, not only are they beautiful but my brother said they were the best cupcakes I ever made! Everyone loved eating the raw cranberries, if you are considering making this go ahead and make it. I will make it again this holiday season. I cannot say enough about these cupcakes. Hi ive made these a couple times and absolutely love them, im making them for a bridal shower and was wondering if I could make them ahead of time and just freeze them ? Do I put the ganache in before I freeze or after I thaw them out and frost them? Im also going to be tripling the recipe will that have a negative effect ? Thanks! Hi Jessie, Tripling the recipe should be fine. You could make ahead of time and freeze (without the frosting). You could do the ganache before freezing, it will thaw with the cupcakes. 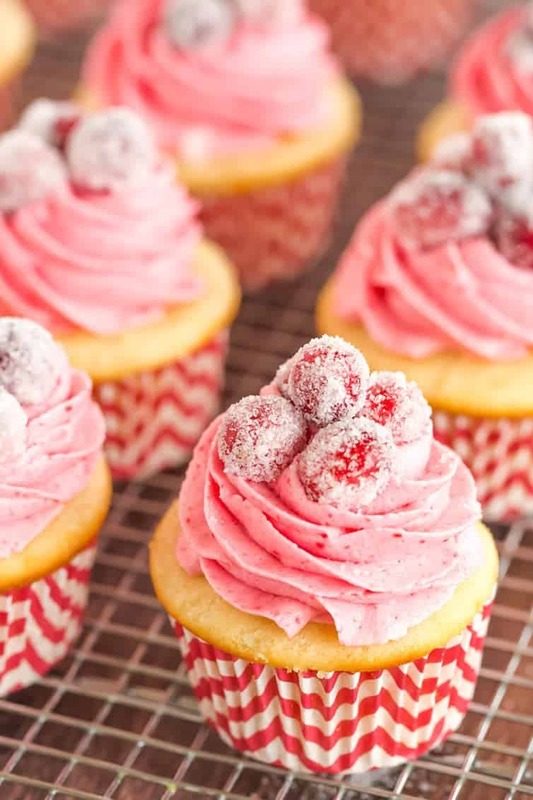 Can you use frozen cranberries for you sparkling cupcake recipe? Thanks! Hi Alison, I think it would work okay. I love your cupcake recipes and am excited to try this one! Do you think it will work with thawed, frozen cranberries, for when fresh cranberries are not in season? Thank you! Hi Chelsea, Yes, I think that would work! I just made these for NYE and though I have only tasted the scooped out centers of the cupcakes I know they will be divine when I put them together. I just got my brand new range yesterday so I was able to break it in by baking these gorgeous cupcakes! Thank you for the wonderful recipe. I think I’m going to sub sparkling wine for the milk and water next time and see how it goes. I made the cranberry cupcakes topped with the sugared cranberries for my Christmas Dinner dessert. Wow! These are amazing and sure to please!! If you are looking for a dessert that is both festive and impressive..this is it. The recipe was accurate in its proportions and very easy to make. There are many steps so read it and get mentally prepared before you start. Thank you brown eyed baker for another great recipe!! These are exactly what I was looking for! I needed a fresh new recipe for my family’s Christmas gathering and these look amazing. I have been wondering how everyone does the sugared cranberries! Another great recipe, thanks so much for sharing. Happy Holidays! I made these yesterday for two reasons: 1) I wanted to see if I could replicate their beauty, and 2) to see how well they would be received by my family-that-doesn’t-love-cranberries. My husband (one of the aforementioned people-who-don’t-love-cranberries) said that they were “amazing”. He actually preferred these over some chocolate cupcakes that I’d also made this weekend, and he’s a serious chocoholic!. My family oohed and aahed about how beautiful they turned out; for people who love eating beautiful food, this is a showstopper. It is guaranteed to be the highlight of any holiday dessert table. As usual, the recipe itself was wonderful. Michelle, you have the best way of making food accessible! You’ve inspired this home baker with some serious confidence during the time that I’ve followed your blog. Thank you for this gorgeous recipe! I’ve been asked to make two dozen for our family holiday gathering! Oh I’m so thrilled to hear this! Thanks so much for sharing your feedback Shani! Have a wonderful holiday! UPDATE: our family had an amazing holiday, and they are STILL talking about these cupcakes. A few of them were smuggled out of my house to friends, and they also raved. This recipe is a must-try for holiday baking. Thank you again Michelle! These cupcakes made me look like a much more experienced and accomplished baker than I actually am. :) To those who read this blog and who haven’t tried any of your recipes: DO IT. I guarantee that you won’t be disappointed. Happy New Year! Thinking of making this in birthday cake form. Picturing 2 layers with white chicolate in middle and frosted pink. Will this be enough cake batter for 2 – 8 inch layers do you think? Oh that’s such a fabulous idea! I would double the recipe for an 8-inch two-layer cake. These are absolutely gorgeous and so festive, Michelle! I saw these the other day and printed the recipe, knowing I needed to make them. They will be on the table for either Christmas or New Years, haven’t decided yet but looking forward to making them. These cupcakes looks absolutely beautiful. Almost too pretty to eat. Almost. WOW! These are gorgeous! And right up my alley. I love cranberry and white chocolate!